We've had a number of teachers contact us recently looking for DVDs that are appropriate for elementary students in grades K-4. Until now we've mainly focused on producing videos for middle and high school students. That's about to change. In December we will be releasing our first DVD produced specifically for the lower grades. 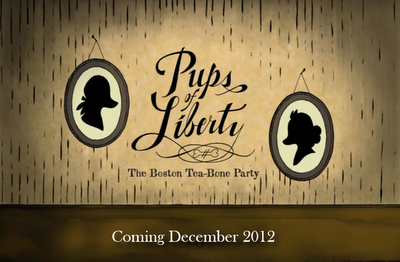 It is called Pups of Liberty: The Boston Tea-Bone Party. This short animated film tells the story of the Boston Tea Party, but with the real people of history portrayed by cats and dogs. It's a great way to teach young students about the ideas and events that led to the founding of the United States. Along with the DVD we'll also have a new section on our website called izzitKIDS which will include interactive features for students. After this initial release, if there is a good response, we're hoping to begin producing more videos like this one. So make sure to tell all your friends and colleagues who teach in elementary schools to check out izzit.org in December!